Autobahn88 Logo - Official Logo - Autobahn88.com [caption id="attachment_4026" align="aligncenter" width="480"] Autobahn88 Logo - Official Logo - Autobahn88.com[/caption] If you have any question about our Autobahn88 Official Logo, please send a E-Mail for ... Read more..
Rally Sport Engine Cooling Parts Shop - www.Autofittings-UK.com [caption id="attachment_4015" align="aligncenter" width="407"] Rally Sport Engine Cooling Parts Shop[/caption] www.Autofittings-UK.com E-Mail us : cs@autofittings-uk.com Read more..
Do you have Roll Beading Tool ? Pipe Beading Tool Intercooler Piping Bead Form Pipes [caption id="attachment_4009" align="alignleft" width="480"] Roll Beading Tool , Pipe Beading Tool Intercooler Piping Bead Form Pipes[/caption] SHOP Here ... Read more..
Silicone hose Quality Demonstration by GEX Performance Made Your Own Brand ? Send a Request for us Now ! E-Mail : info@autobahn88.com info@gexperformance.com Read more..
Silicone Hose - Vacuum Hose Heat Test - By GEX Performance Made your Own Brand Silicone Hose ? Send a Request for us ! 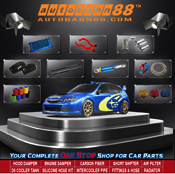 Email : info@autobahn88.com info@gexperformance.com Read more..
Silicone Hose Manufacturing Service – We Ship to Worldwide ! Silicone Hose Manufacturing Service - We Ship to Worldwide ! How it's made the Silicone Hose Kits and Parts by GEX Performance Below is our production team helping our client to prepare ... Read more..
Black Nylon GM: 3078511 3977775 Hood Insulation Retainer [caption id="attachment_3988" align="aligncenter" width="458"] Black Nylon GM: 3078511 3977775 Hood Insulation Retainer[/caption] For Wholesale inquiry :- E-Mail : info@gexperformance.com For Follow our FACEBOOK Page :- Auto Retainers Clips ... Read more..
Wheel Valve Stem Cap Cover Kit Wholesale and Custom Made Service [Made Your Own Brand ] If you have any other Logo request, Send a E-Mail for us ! 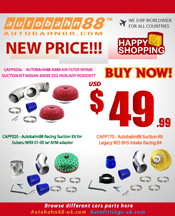 info@autobahn88.com Read more..
Auto Trim Panel Retainer Spare Parts, Clips and Fastener - Wholesaler [caption id="attachment_3978" align="aligncenter" width="480"] Auto Trim Panel Retainer Spare Parts, Clips and Fastener - Wholesaler[/caption] *All of car logo is owned ... Read more..
Intercooler complete kit for Subaru Ver 3-6 Impreza WRX GC8 96-00 - CARP06 Intercooler complete kit for Subaru Ver 3-6 Impreza WRX GC8 96-00 SHOP Here : https://goo.gl/RDlLCH Read more..